Please accept my humble obeisances at your lotus feet. I am in receipt of your letter dated February 20,1967. I am so much thankful to you all for encouraging me in my humble attempt to preach the message of srila Prabhupada in this part of the world. I am sure to be successful if I am blessed by you all Vaisnavas. I can understand your difficulty in the matter of my publication work. I am glad to learn that your activities following the foot prints of our beloved Gosvami Maharaj is being conducted nicely. By the by I may inform you that in the matter of permanent Visa in this country I require some certificates from India. Will you kindly send me a certificate in your personal form of letter as the President and Acarya of the Gaudiya Sangha (Regd) in the following words and oblige. 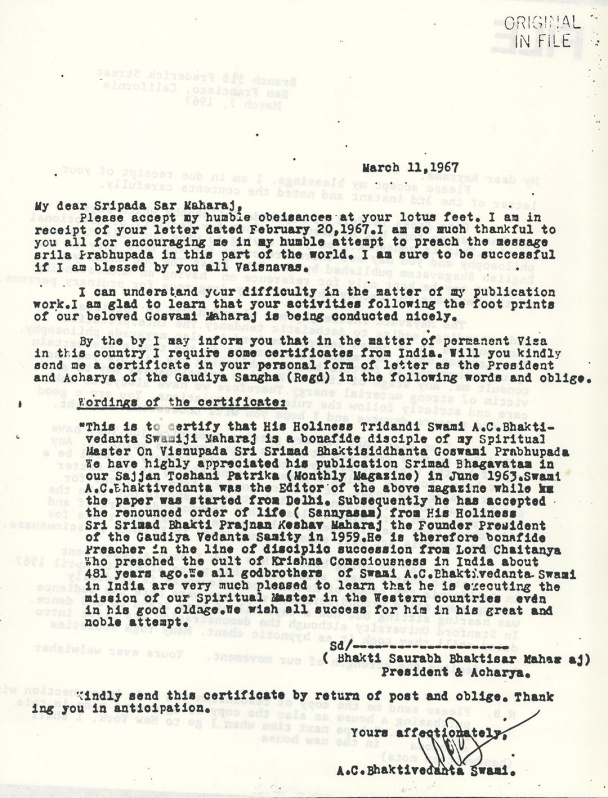 "This is to certify that His Holiness Tridandi Swami A.C. Bhaktivedanta Swamiji Maharaj is a bona fide disciple of my Spiritual Master On Visnupada Sri Srimad Bhaktisiddhanta Goswami Prabhupada. We have highly appreciated his publication Srimad-Bhagavatam in our Sajjan Tosani Patrika (Monthly Magazine) in June 1963. Swami A.C. Bhaktivedanta was the Editor of the above magazine while the paper was started from Delhi. Subsequently he has accepted the renounced order of life (Sannyasam) from His Holiness Sri Srimad Bhakti Prajnan Kesava Maharaj the Founder President of the Gaudiya Vedanta Samity in 1959. He is therefore bonafide Preacher in the line of disciplic succession from Lord Chaitanya Who preached the cult of Krishna Consciousness in India about 481 years ago. We all godbrothers of Swami A.C. Bhaktivedanta Swami in India are very much pleased to learn that he is executing the mission of our Spiritual Master in the Western countries even in his good old age. We wish all success for him in his great and noble attempt. Kindly send this certificate by return of post and oblige. Thanking you in anticipation.